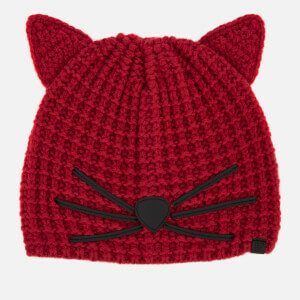 Karl Lagerfeld’s beloved pet cat, Choupette serves as inspiration again in this knitted beanie decorated with embroidered whiskers and 3D pointed cat ears. The soft and cosy hat is made from a heavyweight, wool blend in a stretchy construction. Small branded tab to the rim.